Many people are looking towards water enhancers to help meet their daily consumption of water. Water enhancers can be very flavorful and indulgent when thirsty. At one point or another we have all used some type of water flavoring to satisfy our taste buds; heck I am guilty of it. 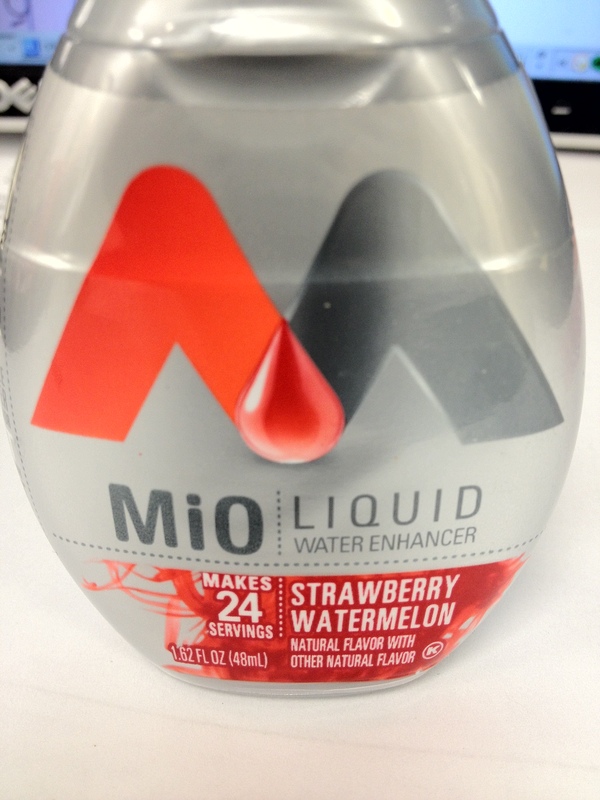 Everyone is talking about the new water enhancers Mio and Spakling Ice, which prompted me to write a post about it. 🙂 Some top name water enhancers include Life Water, Crystal Light, Mio, Sparkling Ice and Vitamin Water to name a few. In my opinion, using water enhancers are not a bad thing however when used as a primary source of water intake may then become unhealthy. Although many of these enhancers are zero calories many contain sucralose, table sugar, malic acid, citric acids, and even corn syrup. When used in high moderation, our health may be put at risk. Sucralose= Sucralose is one the newest nonnutritive sweetener on the market. It is known for its claim to be made from sugar. It is used alone or found in Splenda and is about 600 times sweeter than sucrose (table sugar). When used alone, it provides essentially no calories and is not fully absorbed. It is currently found in over 4,500 products, including foods that are cooked or baked. Although sucralose is not real sugar it may still cause an increase in blood sugar. Malic and Citric acid= Citric acid is most often made using fermentation technology which involves mold fermentation of sugar solutions. Malic acid is used in foods most often is created via hydration of maleic acid and fumaric acid. 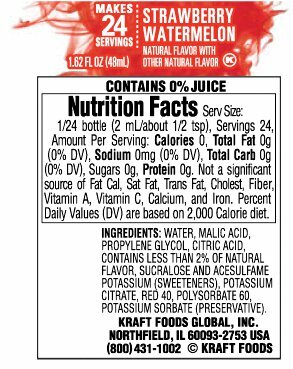 Corn syrup= Most high fructose corn syrup is made from genetically modified corn. A number of studies conducted over the past few decades indicates that consumption of HFCS is connected with a wide range of health concerns. Some health dangers of corn syrup is signigficant risk in weight gain, increased risk of developing diabetes, and elevated glucose levels. The keys thing is to know what you are drinking, not all water enhancers are unhealthy. Check the nutrition label and ingredients to see what it contains. I personally try and stay away from water enhancers but if you need them to help you drink more water try and avoid the ones that contain high fructose corn syrup, sucralose, dextrose, and acids. This is awesome–thanks for the research & info. Another good way to get your daily dose of water is to eat it–in water-rich foods like cucumbers, watermelon, etc…Sometimes water we “eat” stays in our system longer than water we drink. really good post…..I don’t use water enhancers myself…but that’s because I enjoy the taste of water…..and being a diabetic….the water enhancers spike my blood sugars…..thanks for stopping by my blog! Change is good….right? and following my blog! After reading several of your posts I will follow you too…..you will be my encouragement when I get down…lol….thanks again! Water with cucumber or lime is great. Living for jackie got it right about spike in blood sugars. An increase in blood sugar isn’t good for anybody no matter if they are diabetic or not. You may not want to hear from me again but, Sucralose is artificial sugar. Artificial sugar is hazardous to your health. Your better off with just water. The money behind this big bus venture will prevent these Bigs from telling you the truth. They create their own false studies and bury any other study that does tell the truth. If you don’t trust what Dr. Mercola says, I have about 5 others Dr;s that say the same thing. Oh by the way, even though they say 0 sugar, you are getting plenty of sugar. Listen to the tape. Discover the inside story. See how you’ve been deceived about the truth behind artificial sweeteners like aspartame and sucralose — for greed, for profits … and at the expense of your own health. What Drove Us to Drink 8 Glasses of Water a Day? Great info! I never would have thought too add cucumbers. I will definitely try it. Thanks for the suggestion! I like Ginger Ale. I used to drink it like a fish. Diet Ginger Ale. May be 1 of the several reasons I got sick. I avoided the HFCS andthe Artificial Sugar substitutes by finding a low ginger syrup made in Africa. I looked into making my own. I wasn’t up to it. Any way I mix water about 1/2 tsp of the ginger syrup and part Selzer. It tastes like ginger ale and the sugar intake is very low. Just a wiff of ginger. I tried putting the ginger herb in but the taste was too harsh. Yes! I tried the cucumber water out the other day after many people made the suggestion. My new favorite thing now! Thank you for reading! Take care! I’m guilty of enjoying a vanilla diet Dr. Pepper from time to time. Sort of my vice. So I don’t have a lot of room to gripe. However, when it comes to HYDRATION I steer clear of water enhancers like the plague. For training purposes, give me agua, non-enhanced with chemicals. I’ll confess, however, that after weekly group trail run groups, I rehydrate — with beer. It seems to go better with pork carnita tacos. Beer is always a good choice in my opinion. Not to mention the dyes they put in them. To me these are are on the same level as soda with regards to beverage items to avoid. I like to flavor my water with tea or coffee and on binge day I add lemon. Great information here. Correct Tim. Red Dye 10 when it is spilled on the counter or floor can not be washed off. Nasty stuff. I was looking at a product a few days ago salad dressing or something. Good ingredients until a whole list of dyes. I agree with you about the coloring, not good when kidneys try and filter it. Gotta love plain water! This topic caused a lot of great responses! these things bug me because they try to trick people that they are healthy… but all those chemicals are terrible for your health, artifical sugars, especially splenda has a whole host of side effects. I was raised drinking water, we had a mini fridge in the family room that had soda and juice in it that we had to ask permission to take something from, any other time we wanted something to drink we had a water cooler near our kitchen table that was always stocked. now if i want something with some flavor i keep bottles of Santa Cruz organic lemonade in different flavors and cut it at least in half with water. Sometimes I will even mix sparkling water with it if I am craving something fizzy. So much healthier and pretty much always calms my cravings. I wrote a whole blog post about the dangers of artifical sugars, check it out if you have a chance! Your right. You have to read labels on everything. I am still reading labels and getting shocked. I just read the contents on mayonaise It is all Soy which is GMO. Thanks a lot Kristin for sharing the link. Very informative! High fructose corn syrup is in everything. It is ashame. I also steer clear of water enhancers. This was a great post. Thanks for the info. No problem glad you enjoyed it. You’re right it is in everything. I may be waaaaaay off base here, I find this type of non-nutritive product to be a branch of the the hip stylish product distraction. Instead of worrying about what we do when we exercise, if we exercise, we are caught up in the fashion and accessories of exercise. Dress well, dress appropriately, wear your favorite clothes, look good, feel good, drink the cool water brand in the vodka shaped bottle…then what? What can be improved upon water? The bottled water industry doesn’t provide enough distraction, we have to fingerpaint it? I admit freely that I am a music junky. The wrong song can inhibit a workout, especially the shilsnit they play in gyms. That’s my crux. I’m not bringing shiny happy water to my workout, I’m bringing a healthy dose of tolerance for pain. I don’t work out, but I do agree with your observations, I see the bikers and often wonder or at least I think I see the one’s who seem really dedicated and the fashion freeks. Not that you can bike without a major commitment It seems to be a lot of show sometimes. I am sure the workout gym is much worst. At least a biker has to bike somewhere. I spoke to one woman who faithfully goes to the gym every AM. When I suggested coconut oil would make her diet better, she advised me that they advise her what she can eat and what she can not. Wow talk about control. Mammoth King, that is correct too much water will deplete Na or sodium. You body needs sodium. Preventing dehydration is important but learn your body it will tell you when you need water. When I was breaking away from diet ginger ale, I drank water with lemon in it. It helped a lot. Water had a taste to it. I now drink just good ol’ tap water. I added this post this morning. Drinking water is fine but an extensive over 30 min. workout needs to replenish lost minerals. Use Coconut Water for Hydration after a long workout. Excellent points, J-Lay! There is NO GOOD sugar there are only GOOD FOODS. 🙂 I do a lot of fruit infused water, it works well for me, as does Performance Rehydration after a heavy workout. I couldn’t agree more with this! I can’t even try things with artificial sweeteners because one sip will send sharp pains and heart palpitations literally within minutes! It’s scary really because I thought it was from exercise at first- ha! My husband doesn’t go near that stuff, he’s a chemist so you can take that to the bank! Wow. That’s pretty bad as far as the side effects. Sometimes I get headaches and dry mouth too. I’m sure your husband must love his job, I would because I would know all the foods not to eat haha. Thanks for the feedback! Thank goodness you have that sudden of a reaction. Saved your Liver and your health. I have been reading on the stuff in the artificial sweeteners it is down right scary. Please to make your acquaintance. Water is my chief beverage and I do try to add lemon. I don’t care for flavored water at all – Evian is actually my favorite. I do taste a difference though I’m told I’m nuts. Lol you have to drink what you love. Evian is a great water product for a reason I’m sure. I have only had it once or twice but my mom swears by it. Good job at drinking plain ole H2O! Great post. I have to say that this is one of my favorite blogs to read! Awww thanks! I am glad that you enjoy reading the blog!! I am happy that you find the info helpful here! Let me know if you have any special topics you would like to read about. Take care and look forward to speaking with you in the future. So many of them are just TOO artificially sweet for me. I don’t drink enough water, probably, but ice cubes are definitely my enhancement of choice! Good points.. I personally think water tastes great just as it is, but whatever helps people drink enough for the day, right? Mio > crystal light for me though, it comes in handy when we are mixing alcohol with water/soda. 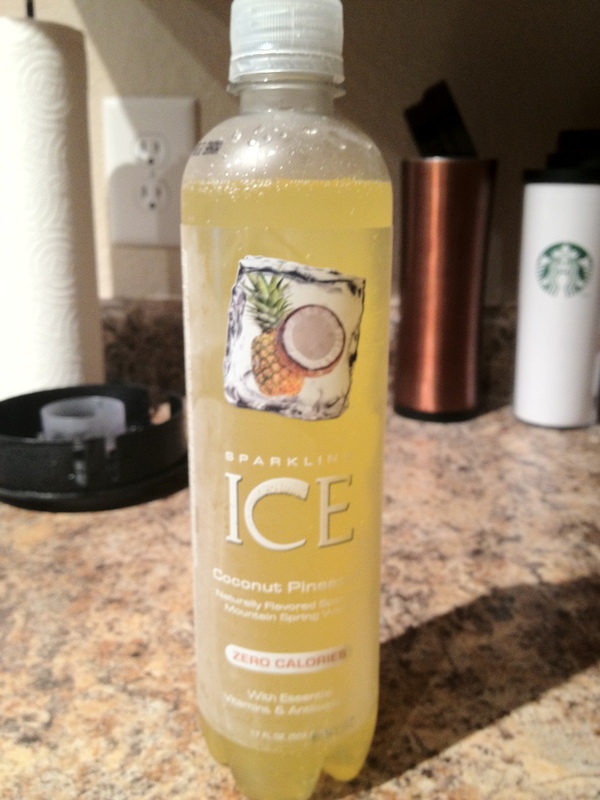 Obviously not something you want to drink everyday, but it beats other mixers like sugarry soda! Also, thanks for visiting! Also I usually keep lemons at work for my water, love that hint of lemon taste. I think we’re being encouraged to buy products we don’t really need. I don’t see a need for flavoured water products. I am fortunate to have awesome clear, healthy, great-tasting tap water, and so that’s the majority of what I drink. I also do love my coffee, but I limit myself. At work, I enjoy clear Earl Grey or Green tea with lunch, but I think it’s more about making sure I sit down with a cup of tea after lunch for 10 or so minutes instead of back to rushing around. I really like EcoDrink from Costco. I drink 32 oz plain then add 1/2 to 32oz (at work) at home I drink whatever I’m in the mood for! Good post! The Husband and I split a 20 ounce regular soda (typically 7up) once a week. Then stick to coffee, iced tea, and water the rest of the time. Before I started this journey, I drank nothing but flavored waters and diet soda. The chemicals would have eventually killed me, I’m sure. I don’t like lemon flavored drinks, but cucumber makes a great addition to water – most fruits do, too. Laura – Thank you so much for the great article! Our mission @ Zest is simple – bring an all-natural, healthy, liquid water enhancer to market with 0 calories, 0 sweeteners, and nothing artificial. Great post! Knowledge is power. It’s so important to read labels for good health! We have been drinking more water but have been using enhancers. Will start working on not use those also. Guess it will start being fresh lemon, lime and cukes Glad we have some great summertime food items. I read another blog recently that advised not to drink water that had been left in the car or frozen in the plastic bottle the drink would be cold or that you would ice in it as it melted. It seems that the plastic that the bottles are made from release cancer causing molecules into the water. Sheryl Crowe believes this is what caused her breast cancer.